Click on photo to see more pics! The trusses were recut from heart of yellow pine timbers that were originally over 50 feet long. The building that the timbers came from was built in the 1840's. 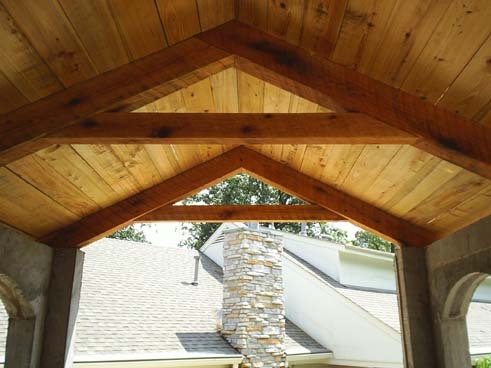 These timber framed rafters were incorporated into a masonry pool house project. The owner was building a Spanish style pool house for entertaining guests and the timber framed rafters will create a unique outdoor space that will be admired by pool side visitors. 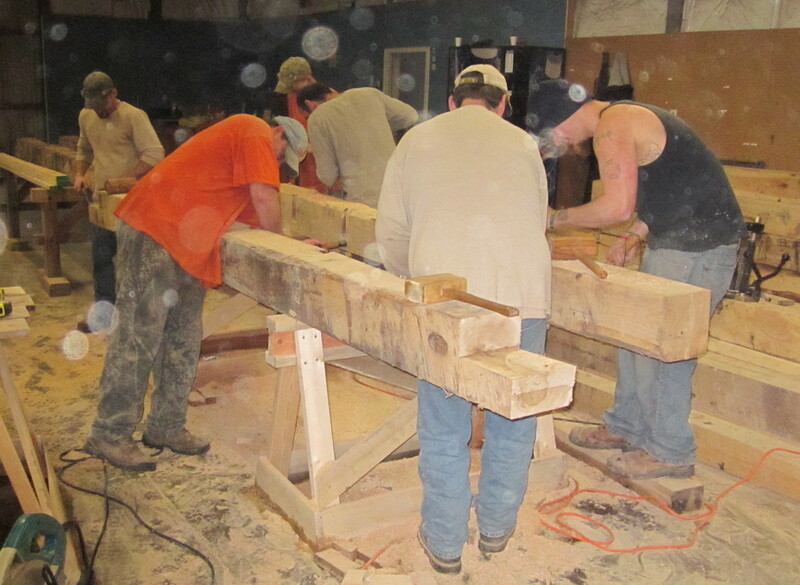 I traveled to Kentucky to help Thomas, a very ambitous student from Grand Oaks Timber Framing. 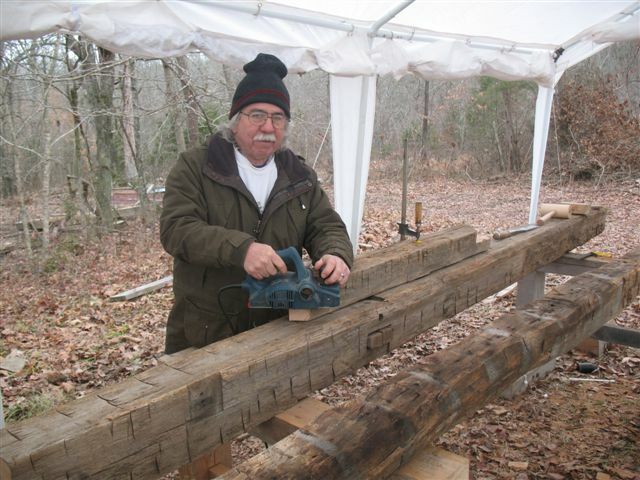 He went from a one week introductory timber framing course to designing and cutting a 3900 square foot timber frame. I spent most of the summer helping him cut his timber frame, which is from timber that he logged and milled from his own property. The frame was raised during the winter and spring of 2006. This timber frame project went into an existing home. 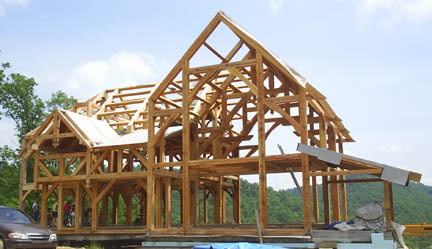 Timber framing is not limited to new construction. 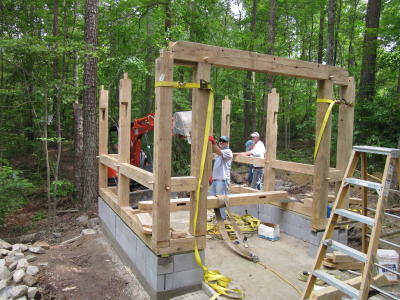 A timber frame addition to your existing home may be a great option for you. 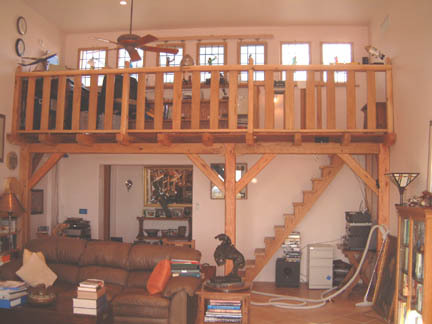 This timber frame loft was "raised" inside of an existing room. 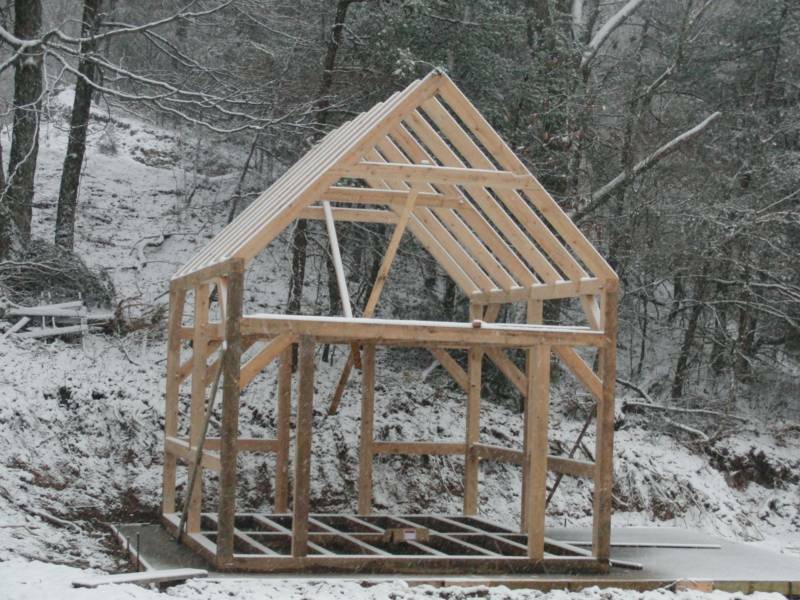 Thomas has started a web blog on the story of building his timber frame. 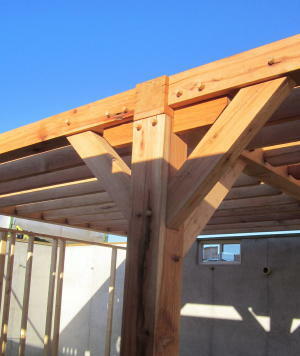 If you would like to see more photos and learn more about his timber frame click on this link! 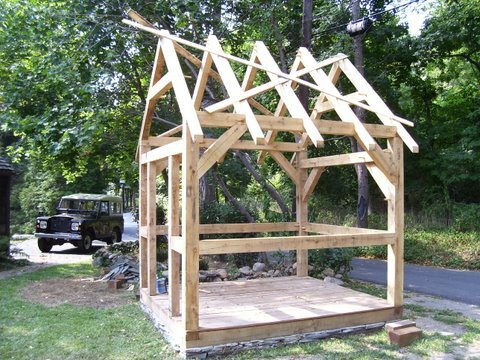 I cut a 16' x 24' timber frame and auctioned it on my website to raise funds for a mission trip to Taiama, Sierra Leone. My daughter and I were part of the group and the money raised supported rebuilding the church, provided musical instruments for the choir, helped a young man with his education, supplied soccer equipment for the youth and helped build strong friendships. 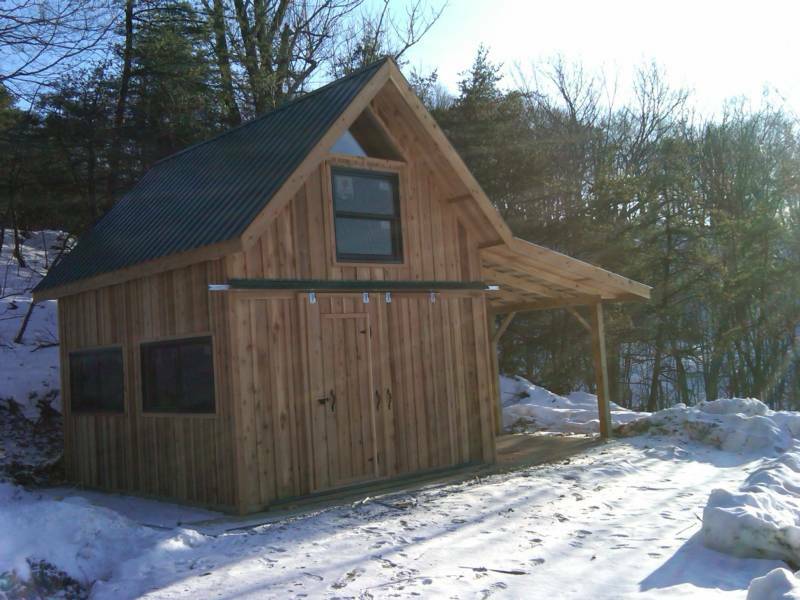 This project was a 9' x 10' garden shed to replace an original structure on the property that was destroyed by fire. Even though this timber frame was only 90 square feet the amount of joinery required was comparable to a larger timber frame. The frame was cut and trial fitted at Grand Oaks and then shipped to New York. It was hand raised in 4 hours by a group of friends. "Scott, I can't tell you how much I like it. It is absolutely BEAUTIFUL!! You did such a great job, that it went up without a hitch. It was so much FUN that 2 of my buddies wanted to take it apart the next day and put it up again!!! You are truly an artist. Thanks again!" 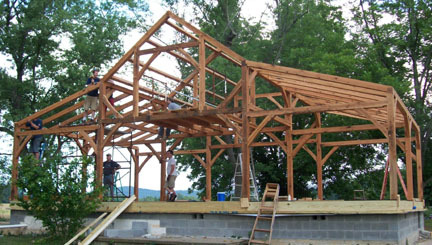 This timber frame was meant to be near water and people getting wet, but NOT on "raising day"! It was a wet day for the raising, but a terrific group of people came together to assemble this frame! Afterwards we got to see the Red Sox win Game 3 of the World Series! In spite of the weather, it was a really great "raising" and went very well! And you thought there was a pot of gold at the end of the rainbow! 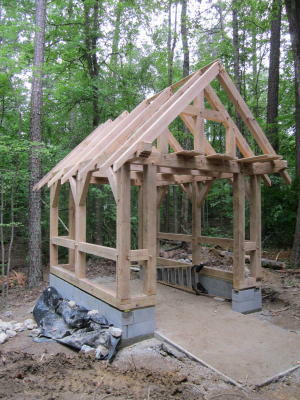 Actually, it is a Grand Oaks Timber Frame! 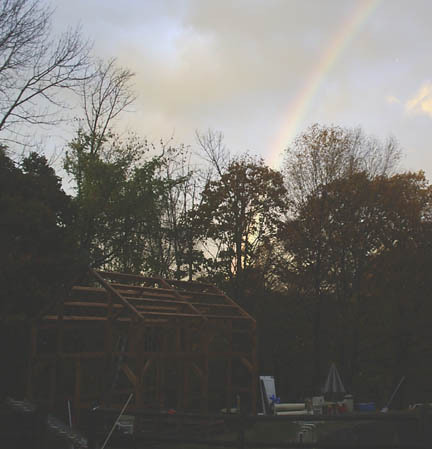 Just as we put in the last timber piece and someone made a joke about building Noah's Ark, this rainbow popped out briefly as the rain stopped! Great ending for a great raising!!! 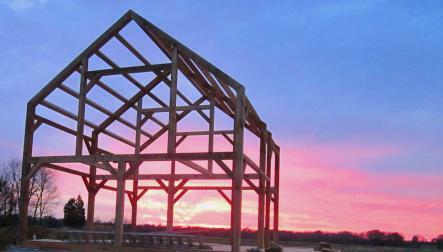 The following morning, the sun was shining bright on this new Grand Oaks Timber Frame! 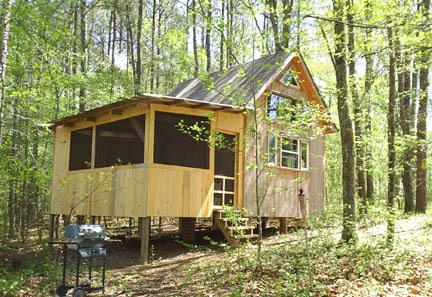 This frame is the "Timberline" plan with some modifications to fit the owners use of the frame. It should be standing for many years along with the other great structures of that area. It was a bit humbling for me to have one of my frames raised where there are so many historical structures! 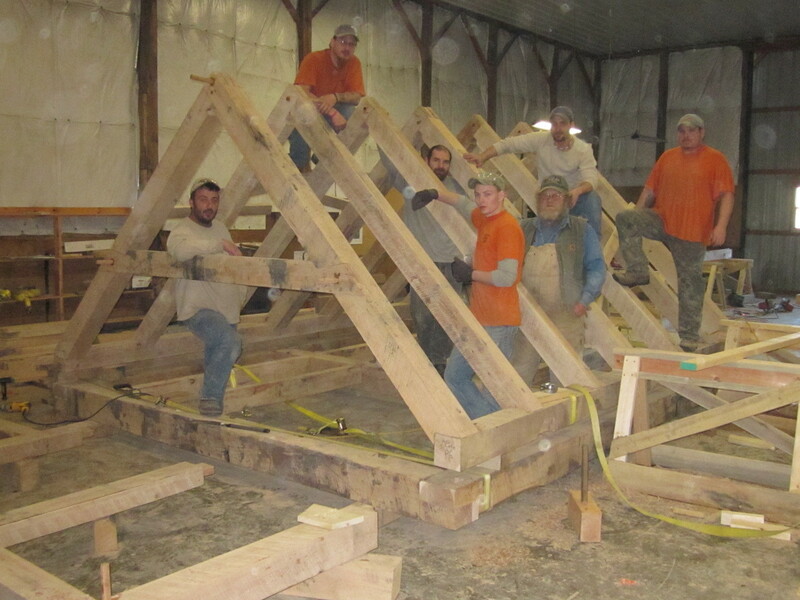 Will was an apprentice at Grand Oaks Timber Framing during the summer of 2007. While he was here, we cut together the 16' x 24' portion of the TimberLine 2 plans. After that he went home to Alabama. 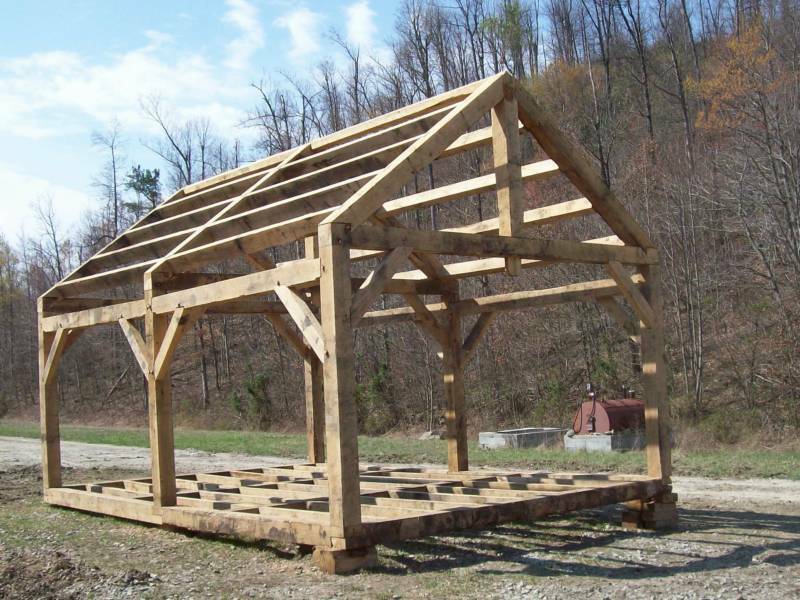 I delivered that portion of the frame to him along with some additional timbers for the sheds. 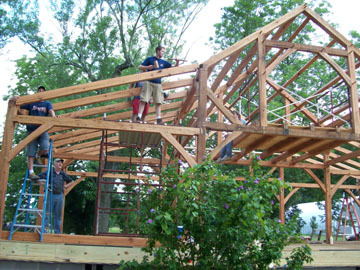 On his own, he cut the rest of the timberframe and hand raised the frame with the help of family and friends on June 21, 2008. "Thrilled with Scott's work on our frame. It's not to many times that you feel "over delivered" in today's world. However that is exactly what I experienced with Scott's work. Frame is great and the assistance in construction was fantastic as well. For any of you looking for a straight deal, Scott would serve you well." 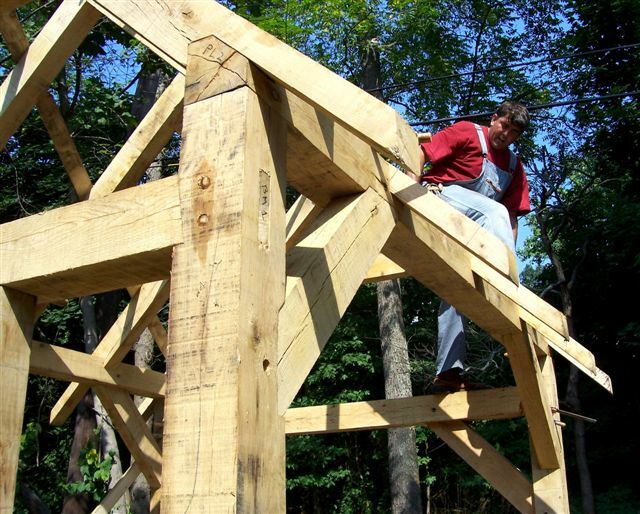 Jared apprenticed at Grand Oaks Timber Framing during the summer of 2008. Together we cut the Little House II design. We added an additional door to the frame. 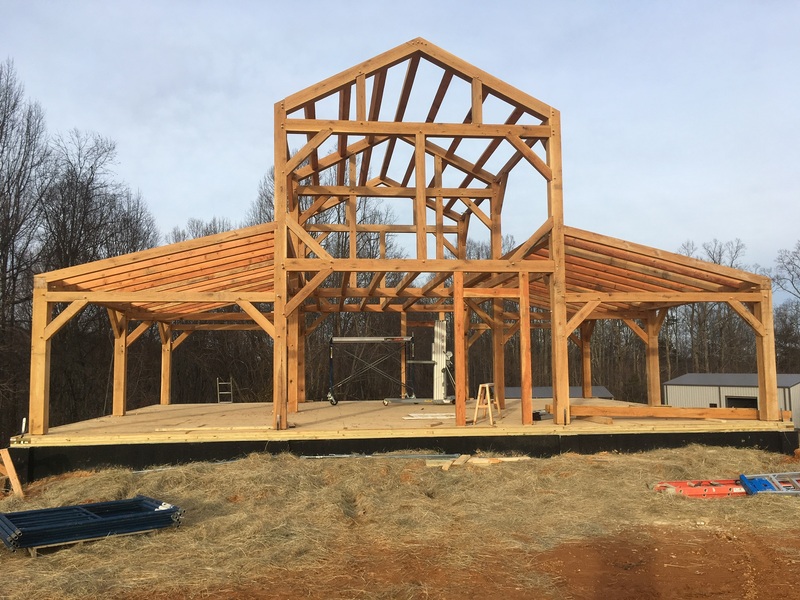 We hand raised the timber frame on his property with family and friends and had a great meal at his Grandmother's house nearby. I cut this 14' x 16' frame that is based on my Homesteader plans. It is nestled in the mountains of West Virginia. It has an 8' x 14' loft. The owner, Brian, finished out his frame nicely and added on the shed. 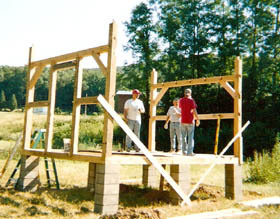 They raised the frame by hand in about 3 hours. I designed this 30' x 40' frame for the Howard family with a 6' King Post extension of the Great Room. It has a large loft area with a 9' dormer and 2 smaller lofts above the 2nd floor bedrooms. I worked with the owner for 3 months cutting this frame. We "raised" it on a beautiful sunny day with the help of his family and friends. To see more photos of this projects click on this photo. Mark was a participant in my April 2009 workshop. 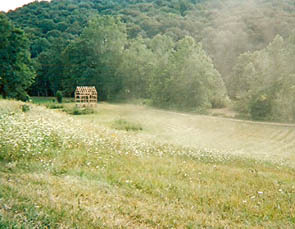 After the workshop he dismantled a barn in Kentucky that had many different shapes and sizes of hand hewn timbers. There are different wood species, oak, chestnut, walnut, poplar that we are working with. 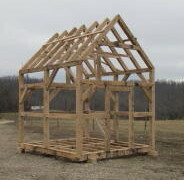 Using the available timbers I designed a new timberframe. This is an ongoing project at the moment and have about 2 bents cut. The roof system will be made out of replacement timbers. This will be a very interesting frame with the hand hewn timbers and the old mortises showing from the frames previous life. 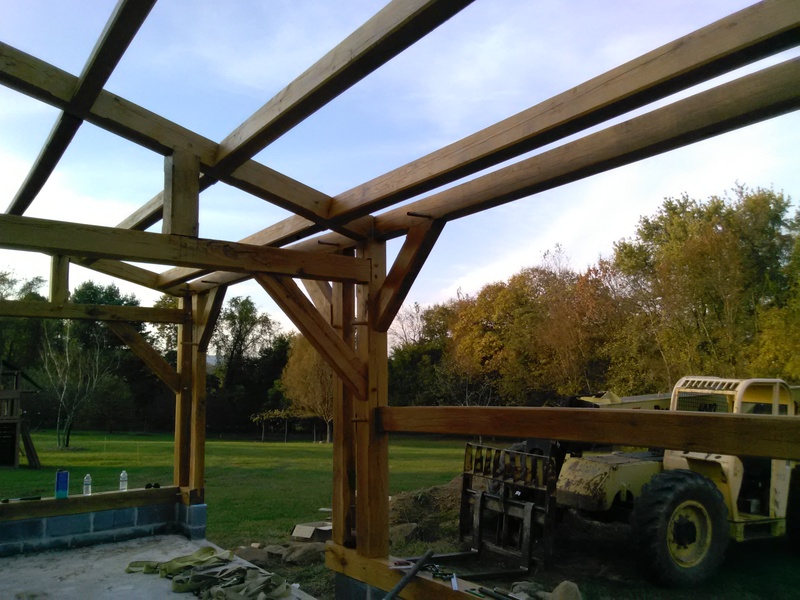 24' X 28' Red Oak Queen Post Timber Frame - I cut this timber frame in Illinois and we raised the frame in November 2011 with family and friends of the owner. 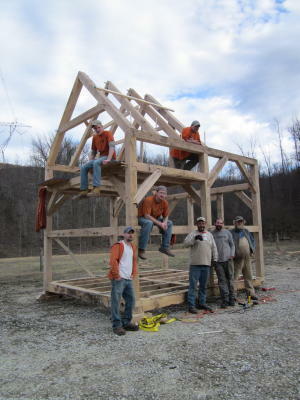 In January 2012 I did an Introduction to Timber Framing Workshop with 6 inmates from a county jail in eastern Kentucky. 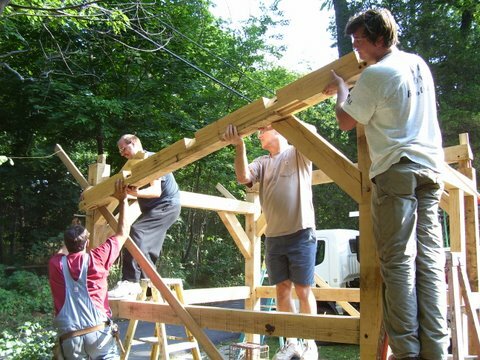 The goal of the workshop was to teach timber framing skills to a core group of inmates, who will then cut more timber frames. 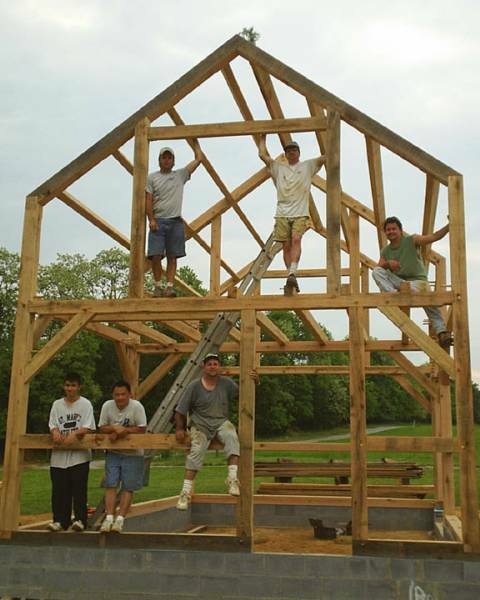 Then as their skills improve, they will instruct future inmates in the craft of timber framing. 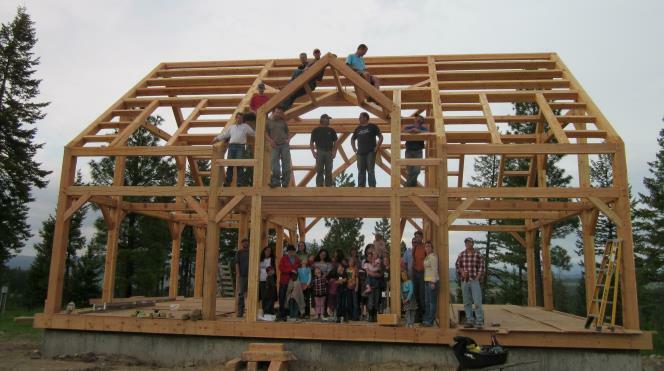 At the end of the week the group had united in a common goal and were excited about the timber frame they had cut. It works the same in all my workshops. When people work together on a project and enjoy the work, good things happen. Some of the men were talking about building their own frames and they were looking forward to the next project they would cut. The goal of the program is to sell the frames to fund the program and purchase tools. Hopefully the skills they have learned will lead their lives into a new direction. Shelterhouse Timberframe cut by the inmates with my plans after the workshop on their own. Nice work fellows!!! 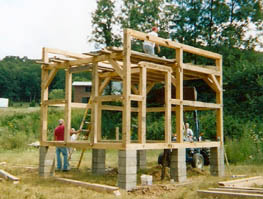 The Little House was the first timber frame that I built. 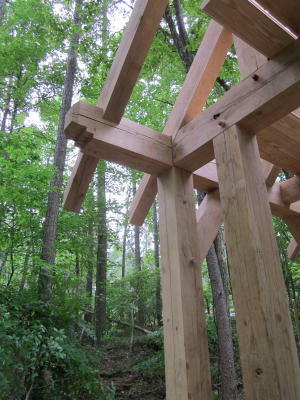 In the spring of 2012, I designed and cut this 10' x 16' trail shelter for a church camp in Alabama. 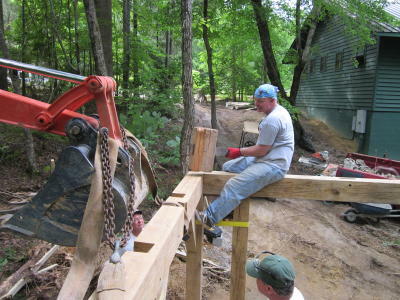 It will serve as the entry way to trail that runs through the camp. 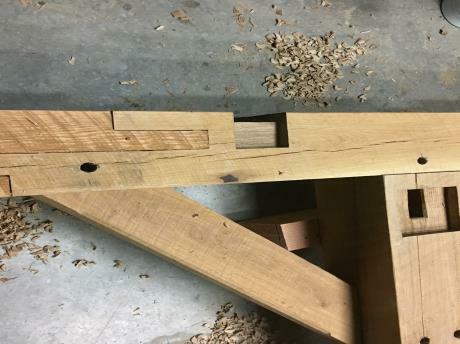 Even though the timber frame was small, it had a lot of joinery work and the top plate had 9 joints that had to line up all at once. 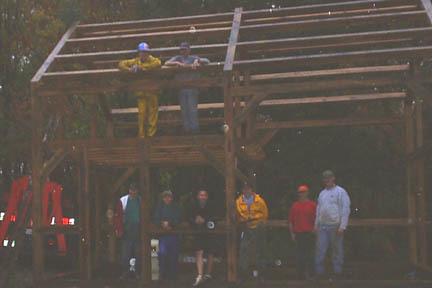 The frame was raised by a group of volunteers from the camp. The concrete foundation will be covered with stone work. 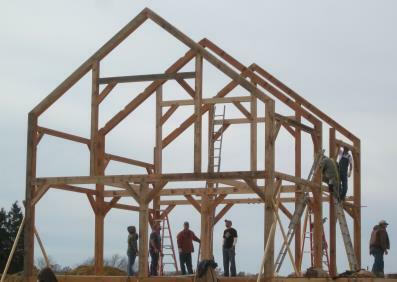 In this project I was cutting a newly designed barn from reclaimed timbers from a barn in Kansas. I cut new joinery in 100 year old Douglas Fir. Most of the joinery is new, but in some places I can utilize the old joinery. 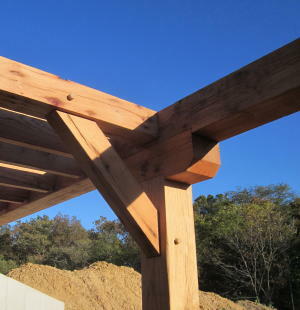 CLICK HERE TO SEE MORE PHOTOS OF THIS TIMBERFRAME. Enter through the narrow gate. For wide is the gate and broad is the road that leads to destruction and many enter through it. But small is the gate and narrow the road that leads to life, and few find it. This project is being cut in Lebanon, TN. 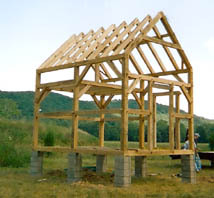 It is actually a combination of a couple Grand Oaks Timber frames. The dining room/kitchen is actually my former workshop which I dissasembled and moved. The living room is the 16' x 24' Timberline plan. I have added a 12' x 24' shed cut from local red cedar for a master bedroom. Most of the support framework in the basement has been timberframed from reclaimed timbers. The combination of frames and a stick built addition for bathrooms/ laundry room/mudroom will make a nice sized home of 1700 square feet. Click here to see more. Although I did not actually cut this frame. Matthew did an apprenticeship with me and I designed the joinery work for a plan he had drawn. He went home and cut the frame. 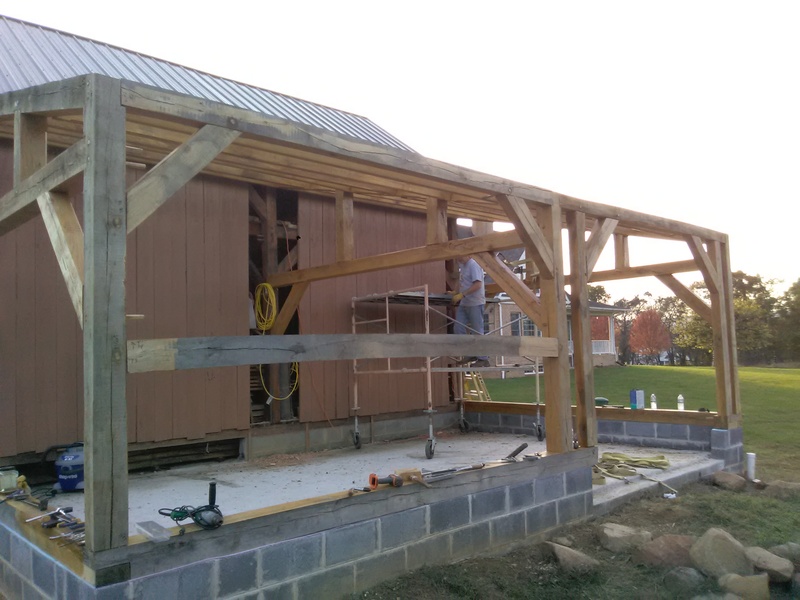 I was able to help him on raising day to get his timber frame together. 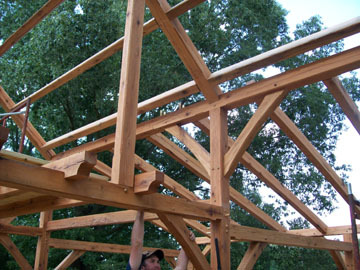 I designed the joinery work and cut this timberframe for a plan the homeowner had drawn. We raised this frame in November, 2015, near Memphis, TN. It is a very nice addition to the pool area and will see lots of use in the years to come. This frame was cut for use as a tiny home for a family that wants to simplify life in a nice location along the Cumberland river. 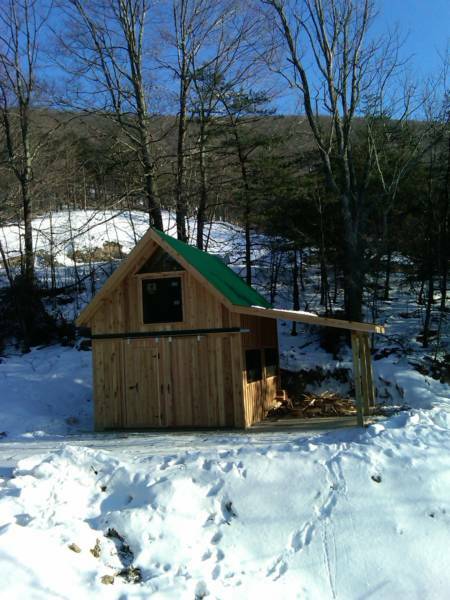 It is a 2 story 14' x 16' and will have stick built shed additions on each side. Less is more! 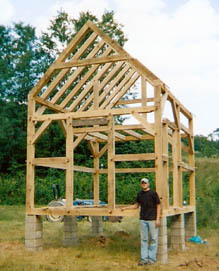 This is a shed addition that I added on to a 16' x 24' Timberline design frame that I cut about 10 years ago. 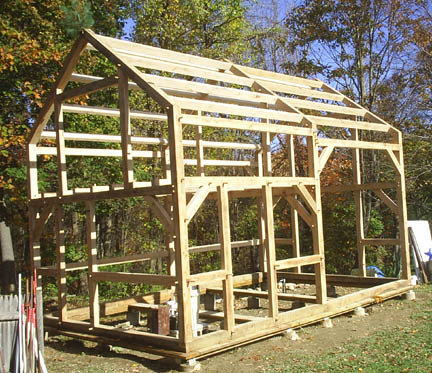 It is a 14' x 24' addition that will give the original frame more space. 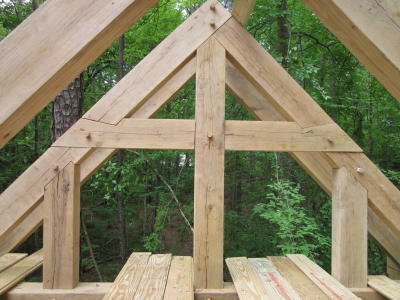 I did not cut this frame, but I did design the timber frame and all of the joinery work. The owner cut and raised the frame on his own. He had previously cut some of my smaller timber frame designs on his own. Nice work! I have a full set of these plans for sale on my PLANS FOR SALE PAGE.